If you have found the person that you want to spend the rest of your life with, congratulations! But before you can spend the rest of your life with her, you need to ask her to marry you. The proposal is a special day you will both remember forever, and you are going to want to make it as memorable as possible. Not just for a good story – but to put your love on display for the person you love. 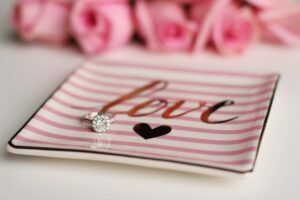 A well thought out, and personalized proposal shows your partner that you are serious about them and your relationship. One of the most important parts of your proposal is choosing the right engagement ring. There are many variables that you need to consider before you buy an engagement ring. Additionally, there are many terms associated with purchasing a diamond people are often unfamiliar with initially. Understanding the cut, clarity and color of a ring is important so you know exactly what you are buying. 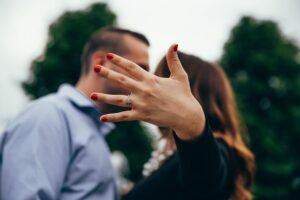 With this in mind, we have created an engagement ring guide that includes everything that you are going to need to know and consider when it comes to purchasing an engagement ring. This is going to be the very first thing you need to decide on before you can even set foot in a jewelry store. Going into the store without a solid idea of what you want to spend will leave you overwhelmed and confused. In the US in 2016, the average ring cost of an engagement ring was $6,000. While that may seem like a lot of money for a ring, it will be worth it when you see the look on your girlfriend’s face when she sees it. However, this doesn’t mean you’re locked into this amount. The ring you buy can be more expensive or less expensive than average depending on what you are able to spend. There are some beautiful rings that look more expensive than they are and if you are on a tight budget, you should look into some of these options. When you are setting your budget, you should set yourself a number that you don’t want to go over. Whether that is $3,000 or $10,000, you need to have this number firmly in your mind so that you don’t end up spending money that you don’t have. Once you get to the jeweler’s they will be able to only show you rings that are within your price range. For example, you may not want to opt for the traditional diamond especially if you want to save some money. Sapphires, Emeralds, Rubies and Opals are all great choices for engagement rings. There are many other stones that you can choose from if you are wanting something other than a diamond. Some men don’t bother to find out their girlfriend’s ring size before they go engagement ring shopping. This is usually a mistake. If you propose with a ring that your girlfriend can’t wear because it needs resizing, it can cause a very awkward moment during the proposal – especially if it ends up being too small and you can’t even put it on her finger. This is the last thing that you are going to want when proposing. There are a few ways to figure out her ring size. The easiest being to simply ask her. Most likely you have already discussed the idea of marriage, so there’s nothing wrong with asking her ring size or even having her go to a jeweler’s to get sized. You can also try asking a member of her family or a friend her ring size if you don’t want to ask her yourself. Another option is finding a ring you know fits her and bringing to the jewelers with you. There are two ways to go about choosing the ring – with your girlfriend’s input and without it. If your girlfriend is very particular about what she likes and there is no way of knowing if she will or won’t like a ring you pick out, then you may want to take her with you at least to get her initial input. However, in most cases, as long as you have listened to your girlfriend, you should be able to find a ring that she will love without having to ask her for help. 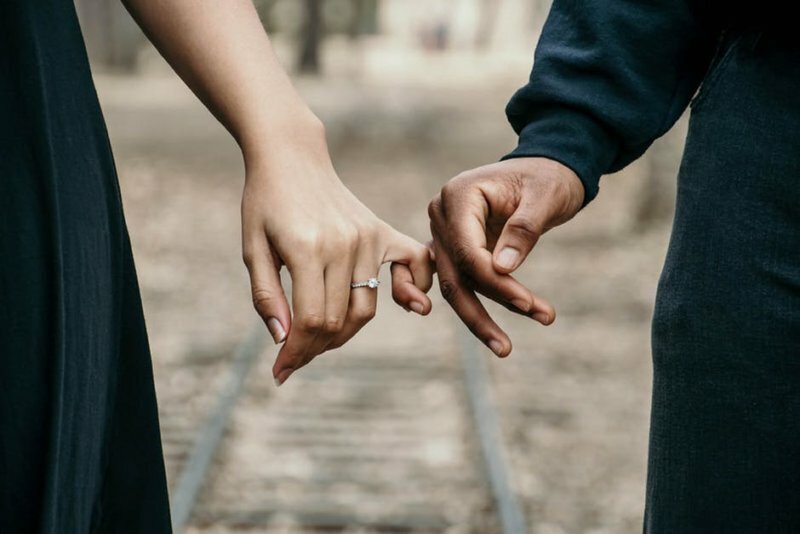 This will make your proposal that little bit more special because it shows that you really do know the woman that you are buying the ring for. If you have been shopping around but are still unable to find the perfect ring and you have the funds to do so, you may want to consider getting a ring custom made. This way, you can make sure the ring is exactly how you want it, and you don’t have to settle for anything less than perfection. If you know that your girlfriend has her heart set on a certain type of ring that you have not come across, you can get this custom made too. There are a variety of metals that you can choose from when you are looking at engagement ring styles. The most common choices are yellow gold, white gold, rose gold, silver and platinum. With each metal will come its own strengths and weaknesses and it’s good to do your research ahead of time and understand which will be best for you. Gold is a soft metal and will, therefore, be easier to clean. However, at the same time, because gold is soft, it will also wear down faster. Alternatively, platinum is a strong and durable metal meaning it will last longer, but it will also dull faster and will not be as easy as gold to bring back its shine. However, your girlfriend likely cares more about what the ring looks like rather than the practicalities of it. So, if your girlfriend prefers silver or silver looking bands, white gold, silver or platinum is going to be the way to go. Cut – The cut of a diamond is the only part about the diamond that is not determined naturally. A diamond that has a good cut will have lots of sparkle. You will know if the diamond is well cut because it will reflect light from one facet to another which will result in the sparkle you see. If the diamond has been cut too deep or too shallow, it will leak light which will result in a lackluster sparkle. Clarity – Clarity is measured on a scale, Sl1 and Sl2 will mean that the naked eye cannot see any imperfections in the diamond and this is the range that you want to be looking at. The fewer imperfections that the diamond has, the more clear and therefore, more expensive it will be. The jeweler will probably discuss the stone’s inclusions with you. These are little imperfections in the rock and the fewer of these that the diamond has, the better. Color – You might be surprised to learn that diamonds come in different colors. If you find a diamond that is truly colorless, then this is very rare and will be extremely expensive. Diamond color is rated from D which is colorless, to Z which is a light yellow. Diamond color is going to be about preference, though traditionally people tend to favor more colorless diamonds. Carat – The higher the carat, the more you are going to pay. If you get a lower carat diamond, you can sometimes ask your jeweler to use smaller diamonds around the center diamond to give it a larger appearance. The Tiffany Setting – One of the most popular choices these days. Eternity Band – Instead of a single diamond, the ring has diamonds all the way around the band. Pave – This setting has lots of diamonds placed closely together. An engagement ring is a huge investment, so you’ll want to make sure that it is insured. You should insure it against theft, loss and damage. There are a few options that you can consider when insuring the engagement ring. You can get it insured under Homeowners or Renters insurance. If you are going to do this, make sure you check the policy to see when it will be covered. This is because most of these insurers will only pay if it was stolen or damaged by fire. Therefore if your girlfriend loses it, it’s gone. Or, you can purchase a replacement insurance policy. These insurers will pay you for the market value of the ring. You will need to tell them what metal the band was, the four C’s of the diamond or diamonds, the insurance company will pay you what the ring would be worth at that time. Now that you have picked the perfect engagement ring, it’s time to propose!